Now ReadingIs *This* the New White Kitchen? 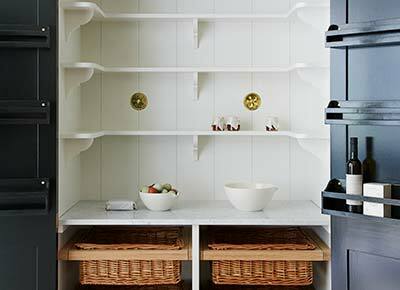 NEXT ARTICLEWhat’s a ‘Larder’ and Could It Replace Your Refrigerator? Is *This* the New White Kitchen? By now, you’ve probably heard the buzz on kitchens: Black is having a major moment. Navy is basically a neutral at this point. Green has travelled back from the 70s. ...But where does that leave us lovers of light, bright and classic? Sure, white and gray are timeless bets, but they’re also terribly safe. Here’s another gorgeous option to consider: Clay. Picture a hunk of raw sculptor’s clay—that’s the hue we’re going for here: A warm gray that instantaneously softens the edges of a room. Note that striking this balance is a fine line. Go too warm? You’ve got a boring beige. Go too cool? Hello, dirty gray. But when you find a true clay tone, that’s when the magic happens. As any fan of white kitchens can attest, one of the best part’s about ‘em is how well they match with everything. The same principle is at work here. We love how this hue reads equal parts English country, Scandinavian modern and California cool. Sometimes, like in the dreamy deVOL kitchen above, all at once!